There are three general categories of seeding: spot seeding, lawn renovation and over seeding a lawn, and renovation. What type is right for growing grass on your lawn depends on the condition of your turf. Enough water has to be supplied to assure germination and establishment. Choose the lawn seeding system that’s right for you and your turf. Spot seeding is a quick and easy way to repair things like ruts along driveways, areas worn by foot traffic, and small areas that have died for any reason. When spot seeding a lawn, use a stiff rake or potato hoe to cultivate the soil and break open the surface. Apply seed to the open seedbed and gently tamp down. Over seeding a lawn broadcasts the seed over a large area. 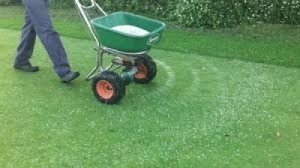 This works well when the lawn just needs a general “thickening up.” Over seeding can be done along with lawn aeration or by itself, but doesn’t work too well when there is a heavy thatch layer. Lawn renovation is for lawns that have excessive thatch, or are so thin, that only a complete rebuild will get the lawn back on its feet. Lawn renovation can be done several ways: old sod can be removed with a sod cutter; the lawn can be dethatched and seeded; or slice-seeding can be used. Slice-seeding (or verticut seeding) is probably the best for growing grass because it “drills” the seed into the soil without having to remove a large amount of thatch. Before you begin seeding a lawn, consider the current season. It’s true that seeding can be successful any time of year, but spring and summer lawn seeding require more care and water, and weeds and crabgrass cause a lot more competition. Seeding a lawn in late summer or fall is ideal. Early fall is preferred because seeds can germinate faster in the warm soil and continue to establish itself through the cooler weather of fall and winter. There’s also more natural water in the fall so less sprinkling is needed. Whatever time of year you choose for seeding your lawn, remember to keep the seed moist until you have good germination. Sprinkle lightly several times a day during hot weather until the grass is 1” tall. Avoid any type of weed control until the new grass has been mowed 4 or 5 times.